Another semi-annual national Drug Take Back Day was held today between 10 a.m. and 2 p.m. and HC DrugFree's convenient drive-thru collection site gathered 1,126.6 pounds of expired and unwanted prescription and over-the-counter medication and 13 large bins of "sharps" (needles, syringes, and EpiPens). 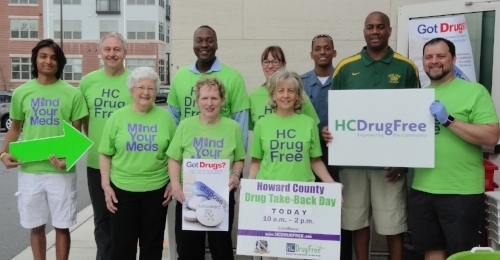 Across Howard County, a total of 1,246.6 pounds of medications were collected today. Thank you to everyone working along with us in the 90+ degree weather today: the Howard County Police Department, the Drug Enforcement Administration (DEA), Adult Drug/DUI Treatment Court, the Howard County State's Attorney's Office, Soroptimist International Mid-Atlantic, HC DrugFree's Teen Advisory Council (TAC), and all our volunteers. It takes a village and this village cares about our children, families, clean water, and the landfill.